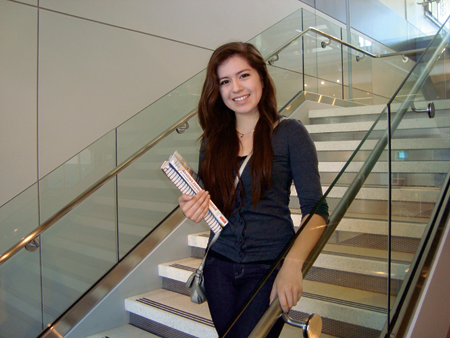 Rock Valley College student Janet Saldana was named a 2012 Coca-Cola Community College Academic Team Silver Scholar in April of 2012. The Coca-Cola Scholars Foundation sponsors the Coca-Cola Community College Academic Team program by recognizing 50 Gold, 50 Silver and 50 Bronze Scholars, and providing nearly $187,500 in scholarships annually. As a Silver Scholar, Saldana received a $1,250 scholarship, a special medallion, and was listed in the April 23, 2012, issue of the USA TODAY newspaper. Saldana is from Belvidere, Ill., and was a participant in RVC’s Running Start program. She was the Vice President of Leadership of the Omicron Eta Chapter of Phi Theta Kappa and transferred from RVC to Duke University where she is currently a senior set to graduate in 2016 with a major in Biomedical Engineering. 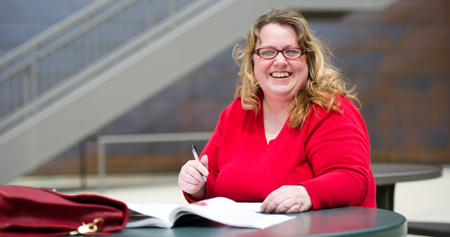 Here’s a profile on Janet from the Duke University Pratt School of Engineering website. In 2006, Rock Valley College signed on to a state-wide grant program, Grow Your Own Illinois, as the community college partner in the Rockford consortium. The Grow Your Own (GYO) idea is simple — it takes a community effort to recruit, support, retain, and graduate teacher candidates who are from the community, who represent the community, and who plan and expect to teach in schools located in their own neighborhoods. GYO is literally charged with “growing our own” future educators. National Louis University (NLU) is the senior educational partner that offers upper-division courses in Rockford (on RVC’s campus) leading to a bachelor’s degree in elementary education with an endorsement in middle school science. In April of 2012, the first cohort of five GYO teacher candidates completed student teaching and graduated from NLU. 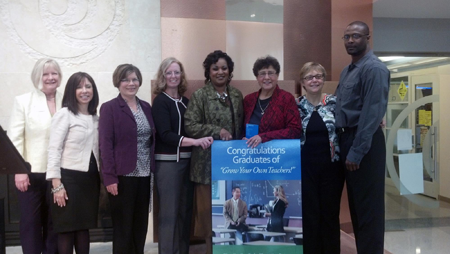 Kevin Bruce, Starla Copeland, Tomas Garza, Colleen Pete, and Elizabeth Wilson were the inaugural class of GYO 2012. All five planned to seek teaching jobs with Rockford Public School District #205. Left to right: Joan Fedota (NLU Asst. Dean of the National College of Education), Sherri Bressman, (NLU Dept Chair of Elementary and Middle Level Education) , Elizabeth Wilson (GYO Teacher Candidate), Colleen Pete (GYO Teacher Candidate), Starla Copeland (GYO Teacher Candidate), Georgiann McKenna (NLU Cohort Instructor), Deb O’Connor (NLU Faculty), and Kevin Bruce (GYO Teacher Candidate). In May of 2012, it was announced that Rock Valley College student Rebecca Hines won the Paul Simon Student Essay Contest for the state of Illinois. Her essay was chosen as the winner by a panel of ICCTA (Illinois Community College Trustees Association) members from amongst 24 entries by students representing community colleges from across the state. This contest is an annual event open to all currently enrolled RVC students. To qualify, each essay must be fewer than 500 words and must address the contest theme of “How My Community College Has Changed My Life.” Each year RVC chooses one winner who receives a monetary prize, special recognition at RVC’s Writing Awards Ceremony, and entry into the statewide contest. Hines is the first and only student from RVC to claim the top prize in the state competition since the competition was created in 1990. On June 11, 2012, the Rock Valley College family mourned the loss of Peter Kostantacos. 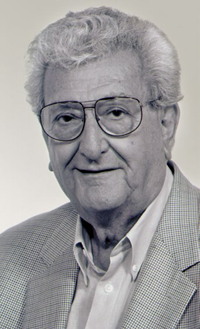 Kostantacos served as General Counsel to the Rock Valley College Board of Trustees for 50 years, providing guidance and leadership to many. He was truly a founding father of Rock Valley College and was instrumental in the referendum to create a community college in Rockford. He was a role model through his dedication to community college education and consistently shared his knowledge, wisdom, and love for our community. Peter Kostantacos was respected, loved, and cherished by many, and is missed by us all. The Rock Valley College Composition and Literature Department’s annual Visiting Writer Series brought in special guest, Daniel Wallace, author of Big Fish: A Novel of Mythic Proportions. Wallace presented a lecture and book signing open to the entire community at RVC’s Student Center Atrium on November 8, 2012. 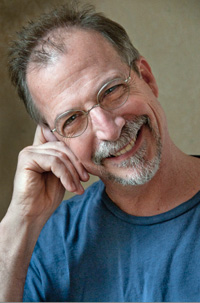 Wallace is a storyteller who’s been called one of our finest contemporary comic novelists. His tall tales are flush with classic myth, magical realism and always a touch of the extraordinary. He is the author of four novels including Big Fish, which was adapted into a blockbuster film of the same name by Tim Burton in 2003. 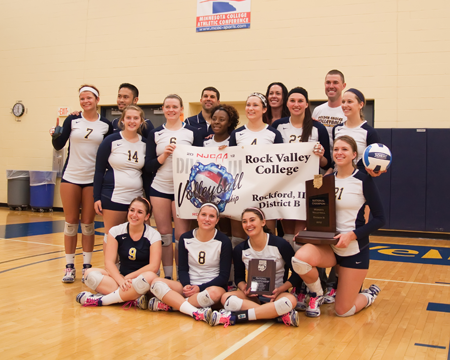 It was a stellar year for RVC Athletics in 2012, especially on the women’s side. Misty Opat led her women’s basketball team to the program’s first national title on March 17, 2012, in Rochester, Minn. 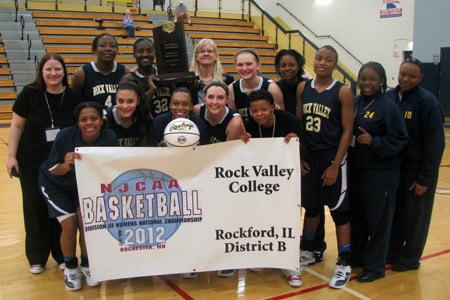 In the first round at the national tournament, RVC defeated Montgomery College- Rockville, 67-62 in overtime. Revonnia Howard tied an NJCAA tournament record in that game with 28 rebounds. The record was originally set in 1979. Howard gave the Golden Eagles a three point lead with under 20 seconds to play in overtime with a bucket in the paint. Jessica Gamble later sealed the win by sinking two free throws to make it a five point lead. In the national semifinals, RVC knocked off top seeded Anoka Ramsey Community College, 63-55, to advance to the national championship game against #3 seed Roxbury Community College. Sophomore Erin Ryczek finished her career at RVC in spectacular fashion by scoring 24 points and Howard put together another monster performance with 23 points and 25 rebounds as the Golden Eagles defeated Roxbury Community College 82-64, to capture the national championship. Later that year, on November 10, 2012, Abby Jenkins took her Golden Eagles volleyball team to the program’s third national championship with a win over national powerhouse Brookhaven, 25-22, 25-10, 25-27, 25-18. It was the third straight season that Jenkins had led RVC to the national tournament as her 2010 and 2011 teams both finished in third place. The team’s 40 wins (40-8) that season stand as the most in the program’s history for a single season.